Kennedy Space Center’s new data center is open for business. 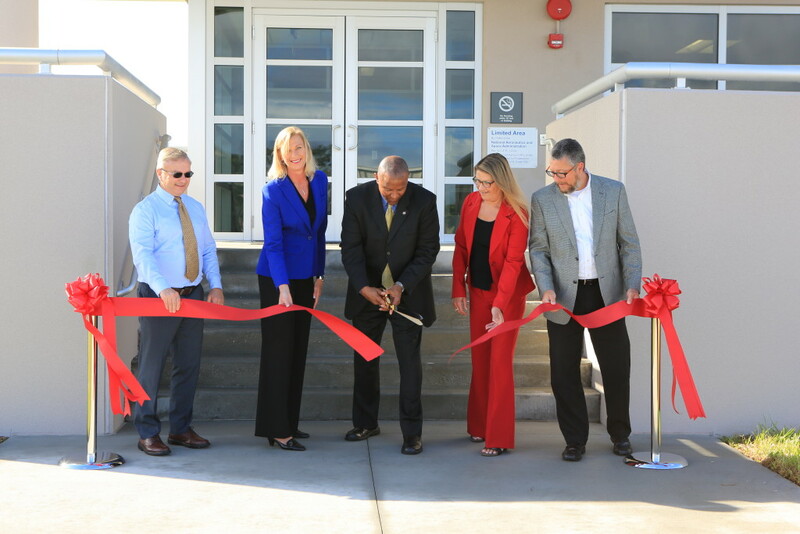 Located in Kennedy’s Industrial Area, the facility officially was opened Thursday morning with a ribbon-cutting ceremony attended by space center leaders and employees. The new data center marks another major milestone for Kennedy and is a key component in the spaceport’s capability to support multiple users, Kennedy Space Center Associate Director Kelvin Manning told the audience. “The data center will support multiple activities – and we have a lot going on,” Manning said, citing the efforts of the Ground Systems Development and Operations Program, the Commercial Crew Program, the Launch Services Program, and Kennedy’s research and technology projects. At only 16,000 square feet, the data center will replace approximately 45,000 square feet previously dedicated to five “legacy” data centers and IT support areas. Once the facility is fully operational, it will be three times more efficient than the legacy data centers, positioning the spaceport to take on even more work, according to Vanessa Stromer, director of IT and Communications Services at Kennedy. Consolidating the data centers into a single new one provides streamlined IT operations, improved efficiency and round-the-clock support. Nancy Bray, director of Spaceport Integration and Services at Kennedy, pointed out yet another benefit: reducing the Kennedy footprint enables the removal of aging buildings such as the 136,000-square-foot Central Instrumentation Facility, an Apollo-era building that for decades was the hub of instrumentation and data processing operations. “Completion of the data center allows us to demolish older facilities,” said Bray, whose organization oversees the operations and maintenance of the spaceport’s infrastructure. The new Kennedy data center is part of the first phase of construction on the spaceport’s new central campus and is on target to receive Silver certification under the U.S. Green Building Council’s LEED rating system.